Landmark Roma team Andrew Holt, Jake Robinson, Rod Turner and Brodie Hurley in action at Tuesday’s Store Sale. Cattle were drawn from the usual supply area and a good panel of buyers was present and operating. The yarding was dominated by steers and heifers and the quality of all categories of cattle was mixed. Demand held firm for better quality lines of cattle but tapered off quickly for the lesser quality lines. Overall, most categories of cattle saw improvements. Light weight yearling steers under 280kg to restockers increased by 14c/kg. Medium weight yearling steers to domestic feed sold 9c dearer, while the medium weight yearling steers to export feed increased by 18c/kg. Light weight yearling heifers to restockers increased 13c/kg. Medium weight yearling heifers to domestic feed increased by 19c, while the Medium weight yearling heifers to export feed were 8c/kg dearer. There were limited numbers of grown steers and heifers yarded. Medium weight 2 score cows increased by 9c, while Medium weight 3 score cows decreased by 2c/kg. 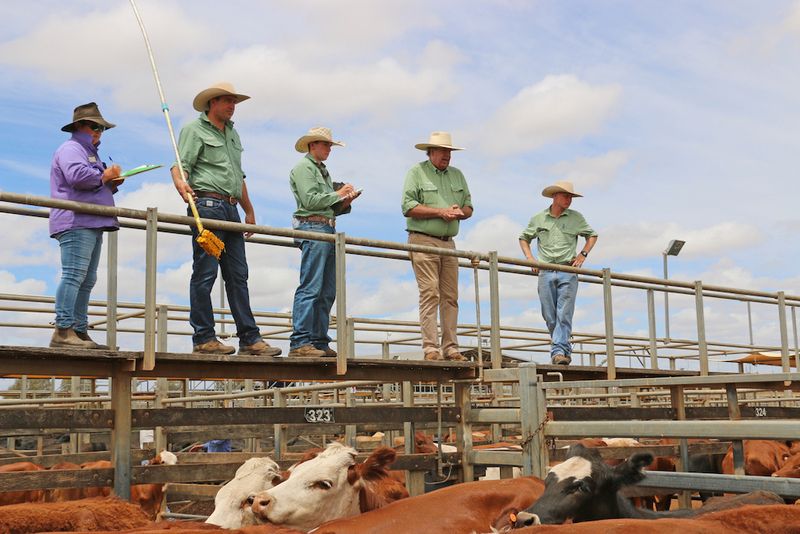 Yearling steers under 280kg to restockers sold to a top of 298.2c to average 283c/kg. A good sample of medium weight yearling steers to domestic feed made to 288.2c to average 281c/kg. Medium weight yearling steers to export feed sold to 300.2c to average 289c/kg. Light weight yearling heifers under 280kg made to 236.2c to average 226c/kg. Medium weight heifers to domestic feed sold to 254.2c to average 243c, while the medium weight heifers to export feed sold to 258.2c to average 244c/kg. The best of the light weight grown steers sold to 256.2c to average 256c/kg. The largest sample of grown heifers made to 240.2c to average 228c/kg. Medium weight 2 score cows sold to 197.2c to average 183c, while the medium weight 3 score cows sold to 223.2c to average 211c/kg. Heavy weight 3 score cows sold to a top of 233.2c to average 224c/kg. Light weight bulls sold to 248.2c to average 234c/kg. Weaner steers under 220kg topped at 286c/kg and averaged 251c/kg, weaner steers in the 220-280kg range reached 298c/kg and averaged 272c/kg. Steers in the 280- 350kg range reached 296c/kg and averaged 270c/kg, and steers in the 350-400kg range reached 300c/kg and averaged 279c/kg. Feeder steers in the 400-550kg range topping at 300c/kg and averaging 279c/kg. Bangor Cattle Co Pty Ltd, Bangor, Mungallala sold Brangus steers to 298c/kg, reaching a top of $791 to average $766. SJ Ward & SK Fink, Karana, Injune sold Charbray steers to 296c/kg, reaching a top of $1,116 to average $890. The Charbray heifers sold to 245c/kg, reaching a top of $829 to average $$778. R Donner, Boxvale, Taroom sold Hereford cross steers to 288c/kg, reaching a top of $1,336 to average $1,240. DW & SG Rowbotham, Retreat, Roma sold Angus cross steers to 288c/kg, reaching a top of $1,251 to average $1,251. DS & CL Brumpton, Richland Hill, Mitchell sold Santa cross steers to 288c/kg, reaching a top of $1,018 to average $948. BJ & WA Donovan sold Charolais cross steers to 286c/kg, reaching a top of $1,100 to average $1,050. G Wilson, Killoran, Injune sold Charolais cross steers to 286c/kg, reaching a top of $977 to average $918. JL, RM, MD & FE Bidgood, Katoomba, Injune sold Charolais cross steers to 283c/kg, reaching a top of $750 to average $732. Tomcat Rural, Balgownie, Roma sold Charolais steers to 280c/kg, reaching a top of $804 to average $804. CA & RL Beissel, Pinetree, Roma sold Droughtmaster steers to 280c/kg, reaching a top of $574 to average $574. A Swan, Springtime, Wallumbilla sold Angus steers to 272c/kg, reaching a top of $725 to average $725. The Angus heifers sold to 238c/kg, reaching a top of $600 to average $600. JP & KA Pearson, Roselea, Roma sold Santa cross steers to 270c/kg, reaching a top of $996 to average $996. The Santa cross heifers sold to 256c/kg, reaching a top of $887 to average $884. GBL & KL Robinson, Bruce Park, Roma sold Charbray steers to 240c/kg, reaching a top of $600 to average $446. Heifers under 220kg topped at 242c/kg and averaged 209c/kg, while heifers in the 220 – 280kg range topped at 244c/kg and averaged 218c/kg. Heifers in the 280- 350kg range topped at 256c/kg, averaging 234c/kg. Heifers in the 350-450kg range topped at 256c/kg, averaging 234c/kg. South Westgrove Cattle Co Pty Ltd, South Westgrove, Injune sold Santa cross heifers to 256c/kg, reaching a top of $984 to average $895. Yorkaringa Farming Trust, Yorkaringa, Wallumbilla sold Santa cross heifers to 254c/kg, reaching a top of $818 to average $818. KE & DE Donner, Boxvale, Taroom sold Hereford cross heifers to 240c/kg, reaching a top of $938 to average $870. EJ & JH Rose, Woodside Station, Charleville sold Angus cross heifers to 236c/kg, reaching a top of $1,086 to average $1,086. PD & D Leahy, Mytraceae, Wallumbilla sold Angus cross heifers to 226c/kg, reaching a top of $616 to average $616. Cows in the 300-400kg range reached 191c/kg and averaged 166c/kg, while cows in the 400kg-500kg range reached 223c/kg and averaged 187c/kg. Cows over 500kg topped at 240c/kg, averaging 219c/kg.